High Speed Recording -- Smartbuy Phthalocyanine dye provides reliable and stable high-speed recording. High compatibility -- Smartbuy CD-R can be recorded on most computer CD writers and can be played back on most CD/DVD-ROM and players. High Durability -- The advanced Phthalocyanine dye guarantees Smartbuy CD-R's high durability. AAA grade quality. 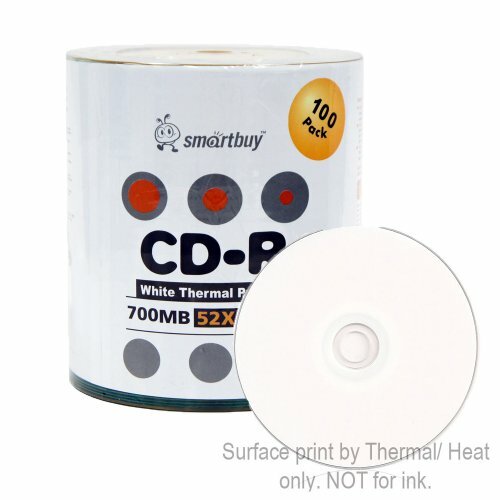 700mb/80min 52x CD-R Smartbuy White thermal hub printable disc. Can use marker write on the top surface of disc. Can label the disc. Excellent compatibility with most CD-R/CD-RW drives. Can be played back on most CD/DVD-ROM and players. This write-once disc helps preserve digital data before they got deleted accidentally. Top quality and durable disc, good for long-term data archiving. Relatively low cost per megabyte. Surface print by Heat / Thermal ONLY ! No stacking Ring (no groove) design extends thermal printable area into hub. Thermal discs are durable, instant drying and ideal for professional logo applications.